How is Bhopal Gas money being used? Babulal Gaur is the seniormost member of the Shivraj Singh Chauhan cabinet and holds the charge of Bhopal gas disaster relief and rehabilitation and urban development departments. The urban civic bodies are, thus, his responsibility. 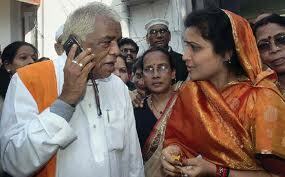 His daughter-in-law Krishna Gaur is the Mayor of Bhopal Municipal Corporation. She lives at Gaur’s official bungalow and not at the residence earmarked for the Mayor. Gaur (as Bhopal gas relief minister) decides to purchase 500 garbage-containers, each weighing 220 kgs, with the funds from the Bhopal gas department and, as minister of urban development, donates them to the Bhopal Municipal Corporation (read Mayor Krishna Gaur) for installing them in the city. These containers are installed not in the gas-affected localities but in the localities in new Bhopal which are mostly inhabited by the BJP-supporters. Bhopal Gas Peedit Mahila Udyog Sangathan (BGPMUS) convener Abdul Jabbar did some homework and found that an amount of Rs 17,765 was paid for each of the containers as against the market price of Rs 13,200. Jabbar has calculated the bungling of around Rs 10 lakh in the purchase. On March 31, Jabbar wrote to Gaur with his “findings” and sought to know why the funds meant for the gas victims were being used for other purposes. He is still waiting for a reply.